We have been offline for a week and a half while at sea, cruising through the fjords in Norway. When we first started planning our trip around the world we threw out to friends and family that we would meet anyone, anywhere as long as we could get there somewhat easily given our route (the offer still stands). When Dave's parents asked if we would meet them for a Norway cruise, we immediately said yes without having much knowledge about our destination. What I knew of Norway was that it was expensive, but astoundingly beautiful. The cost of the cruise was significantly above our usual daily budget, but it was a splurge we planned to make when we started our journey. It turns out that the cost of the 10-day cruise was cheaper than trying to see Norway on our own. Everything we heard about the price of things in Norway was confirmed when we were in ports of call, and we were somewhat prepared (two beers for $25?). Everything we heard about the country's beauty though was blown out of the water and we were continually in awe. Norway's scenery is dramatic, spectacular and quaint all at the same time. 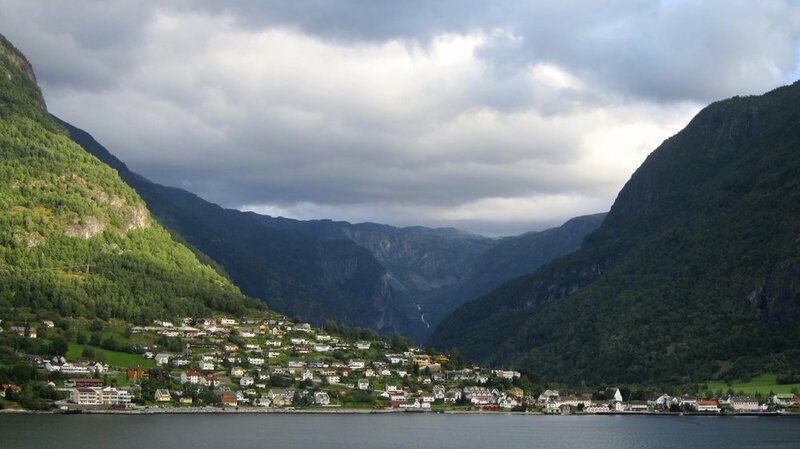 The majestic fjords plunge deep into clear blue water and tiny red and yellow houses dot the landscape. Norway is 50 percent mountains, 10 percent lakes and 25 percent forest, which means that only 15 percent of the land is actually inhabited. The majority of residents live near the water and networks of boats, trains and roads link them together. It results in picturesque towns perched on the sides of mountains, sitting at the shore of the sea and tucked into the ends of the vast fjords. Our cruise on the Celebrity Infinity left from Eastern England and stopped in seven very different Norwegian towns. From the bustling city of Oslo to the serene and remote small town of Olden, we wandered through some of the most amazing places we have ever visited. 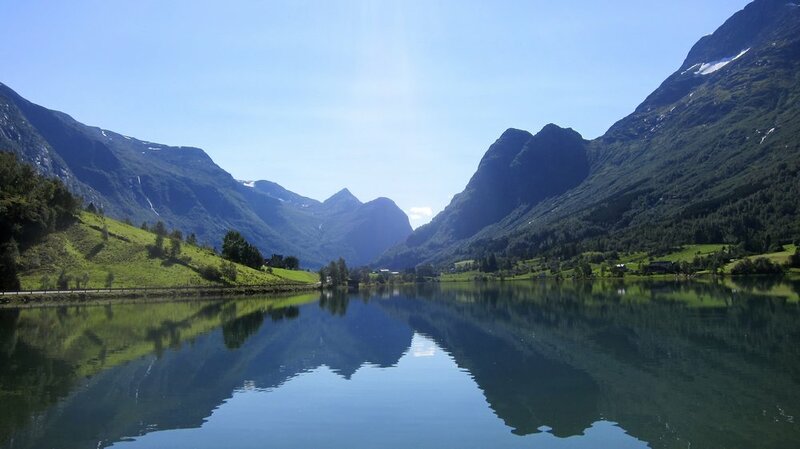 For people like us who love the outdoors - particularly mountains and oceans - it is hard to beat Norway, and cruising was a fantastic way to be introduced to the country. Almost every port had free, "do-it-yourself" excursion options, especially for hikers. Cruising isn't necessarily our preferred mode of travel, but after eight months on the road, it was a welcomed luxury. Not having to figure out where we would stay, how we would get there and what we would eat for 10 days has truly spoiled us. Oslo is a lovely city that surprised us at every turn. Older, well-preserved European buildings line the streets and cafes and restaurants were bustling in the neighborhoods on a Sunday. The quaintest apartment courtyard in Oslo. I'm ready to move in. The Vigelandsparken Sculpture Park houses 212 sculptures all done by Gustav Vigeland. It is the largest sculpture park in the world and depicts scenes of life in striking ways. Overlooking the Vigeland Sculpture Park in Oslo. Stavanger A small, maritime city on the southwest side of the country, Stavanger was a little lackluster for us. The Lysefjord is the key attraction here, along with the Preikestolen (Pulpit Rock) formation. Unfortunately, our time in port wasn't enough to allow us a visit, which is one of the major downsides of cruising. The views from town though are pretty and was a nice introduction to the beauty that was waiting ahead. Flåm In the early hours of the morning, our ship pulled into the Aurlandsfjord and docked in the town of Flåm. Walking to the top deck, we were greeted by the green mountains surrounding the ship and our first real taste of the fjords. We were blown away. Flåm is a teeny town at the end of the fjord, but has a brewery with some of the best ambiance around (and good beer) and a network of hiking trails. We opted to kayak the fjord and had a wavy, windy ride through its waterways. More on our kayak adventure in a future post. The view of a neighboring town while exiting the fjord in Flam. Ålesund Unfortunately, our time in Ålesund was greeted by rain, clouds and a generally overcast day. A 418-stair walk up to the Aksla Hill viewpoint provided a good workout and a view perched high above the town. A network of trails links a few towns along the hillside and we had a nice, misty 8km hike to round out our day. View from Aksla viewpoint in Alesund. Geiranger The day before arriving in Geiranger, we were continuously told it was the "crown jewel" of Norway's fjords. It lived up to the hype. Again, we pulled into the fjord in the early morning and as we hopped in the tender at 7:30 a.m., we almost had the place to ourselves. A great network of trails wind around the town and we had the best day of the trip hiking the 5km up to the Losta viewpoint, high above the fjord, the turquoise water and the ships below. The first people up to the Losta viewpoint that morning - overlooking the fjord in Geiranger. Sailing away from Geiranger in the afternoon provided some of the best scenery of the entire trip, including the Seven Sisters waterfall. Everyone on the ship was on cloud nine in Geiranger. It's a destination not to be missed. The Seven Sisters waterfall (seven rivers come together to make the fall). Olden When we left the ship around 10 a.m. and saw people already getting back on the ship, our hopes for our time in Olden immediately fell. What the town lacks in sights though, it makes up for in its laid-back nature and its elegant beauty. On a sunny, almost 70 degree day, we walked out of town and had a lake almost to ourselves for the entire afternoon. Olden is a town you find yourself surprisingly more interested in as the day goes on and we found it hard to get back on the ship after our great, relaxing day. Lots of serenity in Olden. Bergen The peacefulness we felt in Olden quickly disappeared when we arrived in Bergen - one of Norway's biggest cities. The sun was shining (a rarity in a town that gets rain more than 250 days a year) and five cruise ships were docked. We had a short bus tour of the city, learned a few facts, browsed the famous fish market and then retreated to the ship after the crowds became too much. It was a disappointing stop to end our Norway port visits, but purely because of the crowds. The old wharf in Bergen. A few years ago, we cruised through the Inside Passage in Alaska. I thought that was a great trip with dramatic scenery. Norway surpassed our Alaska trip in every way. If Norway isn't on your list of places to see in your lifetime, add it. You will not be disappointed. We found the Celebrity cruise line to be fantastic. The food was delicious and they had a healthy food cafe that was one of my favorite things. The staff was all friendly, nice and had great senses of humor. It was the best cruise we have taken by far.